Wouldn’t it be nice if you could get all of your groceries for free every week and get rid of the grocery budget for good? It sounds like a great dream but let’s be honest, it’s not reality unless you’ve won free food for life. I will warn you before you read this that not all my ideas are traditional in the sense you go into your grocery store and walk out with free food. 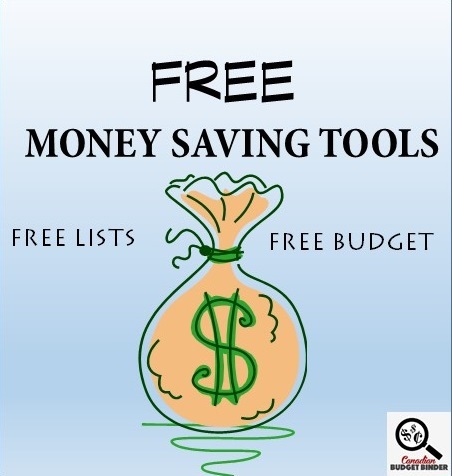 I will however share with you the ways you can find free food that will cut back on your budget expenses. When Mrs.CBB and I were chatting about getting free food we both realized that not everyone does a grocery shop at the supermarket for food. Some people can’t even afford to step foot into the grocery store so they must source food from other resources. This led us to the conclusion that you could get free food but it might no necessarily come from the grocery store. You might also not get everything that’s on your wish list but you will get food to eat but when it’s free are you really going to complain? Most shoppers create what would be considered a basic grocery list every week based on their grocery budget provided they have one. It’s shocking how many people freestyle shop and just pay the grocery bill. Not everyone goes the extra lengths to put a budget in place so they just hope they don’t spend more than they should be. 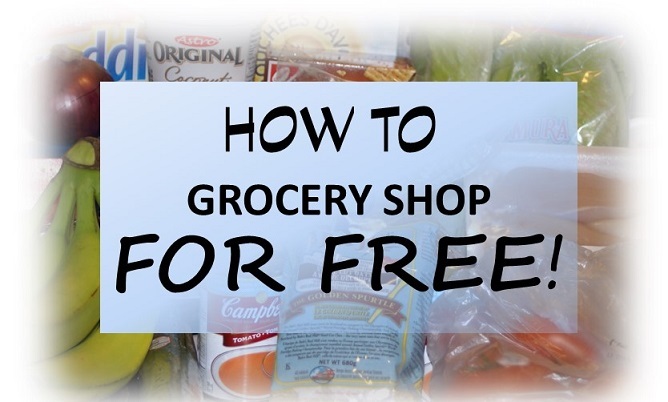 If you are a smart shopper and you really need or want to get free food the grocery store is the place to start but it’s certainly not the place you are going to end at. Let’s have a look now at all the places I found that you could grocery shop for food and not attack your wallet. This is a no-brainer and just about every store and credit card has some form of rewards program you MUST sign up for. It is true though that in this category you have to spend money to make money to get free food but free is free. When stores or credit card companies pay you to shop by rewarding you with points that you can later redeem at the grocery store for free food you’d be a fool to pass that up. Rewards program sign-ups won’t have companies doing a credit check on you so open them up and collect points when you shop. However I wouldn’t suggest opening credit cards just to get these perks. Find one that suits your needs if you choose to go down that route. We are fans of the President’s Choice Program and that’s what we use in the CBB house. If you want to cut your grocery budget this is the way to go. Why not shop for free at the grocery store and reap the rewards as a loyal customer. We do it all the time!! The Shoppers Drug Mart Optimum program, Neilsen home scan program, PC Plus Points are just a few programs that we are involved with that I know offer you some form of $ or points to help you grocery shop for free stuff!! That’s a deal worth shopping for. Find out if your local university or other consumer related organizations in your community offer focus groups or free food for opinions. You’d be shocked what companies are willing to pay and give away just for your opinion on new product lines. It’s still free food and in some cases we’ve been paid up to $100 for one hour of food testing and our opinion. I’m no extreme couponing dude but if you know your prices, the deals of the week and what coupons are out there you can easily score free food at the grocery store. Many coupons can be stacked with the new coupon apps where you can get further food discounts and on many occasions I’ve seen some GGC players make money. Not only did they get free food they made cash in the process. We aren’t big couponers any longer but back in the day it was easy to score free stuff at the grocery store especially when the product was on sale and had a further discount plus the coupon. We see this all the time and if you want free food simply scan around the grocery store for Mail In Rebate coupons, stickers or hang tags on products. I’m sure you will find at least one or two products that don’t want you paying a dime for their product apart from a stamp to mail in your receipt to get a full-product refund check. If you think people don’t just shop for mail-in’s think again. Free food, is free food. It’s not just food either think everything in the grocery store. You might also find mail in rebates online that you can print, fill-out and send away with your receipt only to receive a cheque back in the mail weeks later. Free is good! The Scanning Code of Practice is widely used in many stores across Canada but many customers are not educated on the program itself. The important thing here to remember is that free food can be yours if you are alert and watching the prices. I can’t tell you how many times before I knew about this program that I missed out on free food. It was because I opted to have the cashier simply correct the price rather than apply SCOP. So you can certainly score some free food at the grocery store by applying SCOP if it fits the situation. Now I’m not saying you are allowed to do this in Canada BUT it does happen. It’s your choice if you want to get caught but be aware if you are trespassing and get caught you will likely have to deal with the law. There’s no sense sugar-coating what happens outside of the home but people do find free food in dumpsters or by tearing open garbage bags at restaurants and grocery stores. Who are these people? They are called freegans. Freegans love to salvage food to save money and for political reasons because food waste is a big problem in society. Why are we throwing away perfectly good food to eat when there are starving people all around us? That’s a good question and it’s heartbreaking when we hear about the amount of food that is found in trash bins all around our country. I watched a program once about freeganism and it opened my eyes to what really is lurking in our garbage. I don’t even know what the program was called but it captured my attention because dumpster diving for food is not something we hear or see on a daily basis. It’s not just people who have no money digging through the garbage either some of these people have lots of money in the bank or great careers. Lowering waste in landfills and feeding those who need it? I’m down for that. First of all someone did pay for the food initially and now it’s being thrown out. We are essentially paying for someone to pick it up and get rid of it another process on its own. This food is getting pretty darn expensive now. The reality here is that many people grocery shop for free from people or companies who throw food away. Realistic for the everyday consumer, not really BUT it’s out there. Many times we have been fortunate enough to get full-size free food samples which helps cut our budget expenses. If you troll the internet you can find all sorts of freebies that will be mailed to you in the form of the actual product or free product coupons. Some people do this on a daily basis and enjoy the thrill of getting free stuff especially food. Some of these high-value coupons that are given out by companies like the Chapman’s $5.00 off coupon at the time would pretty much score you free ice-cream. If you call or email companies and ask to sample their food products they may let you but over the years we’ve seen this practice diminish because of the coupon boom in Canada. Companies are apt to direct you to Canadian coupon sites like Smartsource to get coupons savings instead. We used to email companies every year who would send out coupons or actual products to our house. These companies want to get their products out to the masses because word of mouth sells. Grocery shop on the internet or call companies for food freebies. Entering contests and going on to win them especially prizes such as grocery gift cards, shopping sprees or just an amount of money to get food at the grocery store is a great way to stock up. If you don’t think it’s possible think again. Back a few years ago my wife entered an online Mother’s Day contest where she had to write about her mother and what she would cook for her special dinner. My wife won $200 worth of PC gift cards. Don’t say you will never win because look what happened to my wife! Have you ever won any grocery store contests? If you belong to any Freebie or Frugal Free Facebook pages you know that people give away free food all the time. It’s not easy for some people to throw food in the garbage that is perfectly good to eat. It may be they are changing their diet for health reasons or lifestyle change and would rather offer it for free to people who will eat it. Just the other day we read about a woman who emptied out her freezer of food products she bought that she didn’t think she would have time to eat. She offered all the food free to whoever wanted to come and pick it up. Grocery shop on Social Media sites where freebies are offered in your area. Although you have to pay for a hunting and fishing licence in Ontario (Outdoors Card) besides that fee you can grocery shop the lakes or whichever body of water surrounds you. If you have land that is hunting land you can easily fill your freezer with meat by hunting for food that won’t cost you a penny apart from the license, gun and ammunition. Eventually if you are a lucky hunter or fisherman you will catch more food that would offset those costs. If you know about foods that grow in the wild such as mushrooms and greens you can easily spot these foods if you are foraging outdoors. My father-in-law is an expert when it comes to finding mushrooms, asparagus and other fruits and veg that grow among us but many of us don’t see it. The important part here to remember is you get to catch and source your food, clean it and prepare it the way you want it. A great way to grocery shop for free food is at local garden centres or co-op gardens where you can work for free food. Some of these organization simply need volunteers to help pick weeds, plant food and help harvest it. For your time you get to grocery shop the gardens for free and take home fresh grown fruits and vegetables. Helping out is great and although we should never expect anything in return when we volunteer it’s always a nice gesture from these types of organizations. We have one in our city that I am aware of. Having to go to the food bank to grocery shop is not somewhere people want to be in their lives but have no other choice. The important part is that people can grocery shop for free at the Food Bank and the hep is there for them. If you are someone who doesn’t need the help stay away and leave the food for those in need. You might even make a donation yourself to help others out. Grocery shop the food bank when in need. If your work has parties or meetings where food platters or food in general is brought in offer to do the clean-up and if you are allowed, take the food home. Grocery shopping at work is great when free food is on the table for the taking. I can remember more than one conversation with CBB fans who say they didn’t have to cook dinner because they brought free food home from a work function. Hey, it’s free might as well save yourself some money and eat it up! If you work for banquet halls or even restaurants you may even be able to take food home at the end of the night instead of throwing it in the garbage. Grocery shop your wallet for all those gift cards you received as gifts. If you are so lucky to score gift cards for your birthday or other another occasion you celebrate you can use those gift cards to grocery shop for free. You didn’t pay the money for the gift card so use it to your advantage and get the most groceries you can instead of blowing it on expensive food that won’t stretch the grocery budget. So many people lose or forget they even have gift cards so make sure you track them or use them before it goes missing or is forgotten. There have been times when we are talking to the produce guy at the grocery store and we ask if he’s got any bananas at the back that he is going to get rid of for less and many times he’s just given them to us. Grocery stores don’t want you riffling through their garbage dumpsters but if you really need food there’s no harm in just asking for it. Not everyone has the courage to do this and not every grocery store will hand out free food but don’t assume that nothing will be done to help those in the community aside from local soup kitchens and food banks. Ah ha! I’m sure you never thought to grocery shop in your own back-yard, greenhouse or sun-room but it’s entirely possible to get free food this way. If you are a lover of gardening you have installed rain barrels that collect free rain water that will help your garden grow. You may need to make some initial investments in seeds but at the end of each gardening season you can use seeds from your vegetables and fruit to grow more free food the next year. If you invest in seeds the cost is minimal compared to what you would pay if you went to the grocery store to shop. The water bill might be slightly higher if you don’t have a rain barrel but for those that do gardening is an almost sure-fire way to grocery shop for free. Grocery shop in your back-yard. What other ways can you think of where you can grocery shop for free? Join in the Grocery Game Challenge fun and post your grocery shop in the comment section of each blog post… here are the GGC rules! If you are a foodie like I am you will enjoy going through my Free Recipe Index where recipes from CBB Home Chef Nicola Don and myself are shared every Sunday on the blog. Check it out! (The above total does not include the stockpile budget of $240 per year or $25 per month. Weekly Overview (your final thoughts): Well I managed to forget to grab the coupons yet again so I’m out a few dollars this week I could have saved. I really need to work on getting the coupons ready to go or just leave them in the vehicle. With working so many hours grocery shopping has been put on the back-burner a bit so I’m not making it a priority but I should. I know that I will be focusing more once this month is over as my hours will be shortened by 5 a week. I’m hoping to get back on track. As you will see I found plenty of pink sticker deals this week mainly on cheese which is great as we would never normally purchase at the asking price. When does the Grocery Game close each month? : The Grocery Game Challenge closes at midnight of the last Sunday of the last post for the month but you will still get a ballot when you post your shops even if they are late but I encourage you to stay on schedule. It’s a proven fact the minute we stop doing something that is scheduled that we end up forgetting to do it all together. Don’t let that be you! You can post your shops all month-long. Canadian Coupons: Where can I find Canadian Coupons? : Here are your latest Coupon Match-ups of the week and your weekly Checkout 51 offers from 25 Newspaper Inserts around Canada compliments of Save Big Live Better that you can use to help you save money in the Grocery Game Challenge. 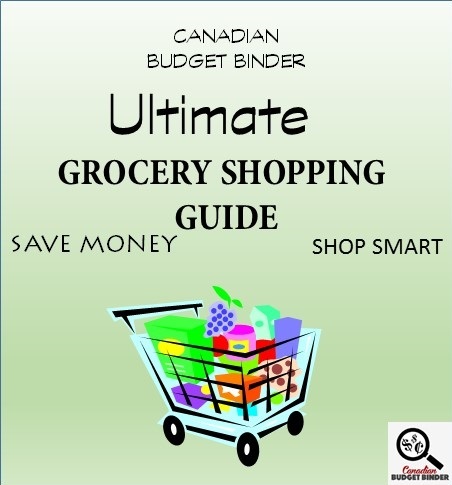 Feel free to read all the above posts that I linked to above which I feel are relevant to learning about the grocery budget and grocery shopping in general. If you are brave and want to learn everything I know about grocery shopping in Canada check out my Ultimate Grocery Shopping Guide! It’s FREE! I thought I was seeing things because I had just moderated your last GGC post seconds ago. Another no-shop week is great. We don’t get to do them as often as we like even though we did aim for once a month. We do try… You get ballot 27 🙂 Have a great night. Hey Mr. CBB, no problem, I am glad you understand! It is actually illegal to sell wild game here, so unless you or someone you know hunts, you don’t get to enjoy 🙁 If you find deer somewhere in a butcher shop, it is not wild, it was farm raised, so it is pricey: http://lakelandmeats.com/farm-raised-game-meats.php The equivalent supermarket meat for me would be pork which I buy when it is about $2/lb or less, so when you compare that to the price of a single deer tag, the cost of the deer meat is not cheap especially if you don’t get a big one. Luckily, my hubby and I hunt in a group, where each hunter is allowed an equal share from all the deer we harvest in the week so that definitely helps us out. Our group does the initial processing and my hubby and I take our meat “as is” so we don’t pay extra processing fees, but others in our group take their share to get processed into pepperettes, summer sausages etc. for an extra cost. It is cheaper to get deer meat made into processed meat than buying it at the store. I have heard as well, if you hunt big game like bear, moose etc., the meat can be very strong, gamey-tasting so most people process that meat so it is more palatable. And of course, there are people who don’t want to deal with any of that stuff, and will take the whole animal right to the butcher shop and pay the butcher to do it all 🙂 If you are an avid fisherman like you said, fishing can be fairly inexpensive, and if you are an avid hunter, a small game license is cost-efficient for $25.15 allows you all the rabbits, squirrels, racoons, grouse, partridge etc. you can find. I wasn’t aware of all the tags after the license so thanks for clearing that up. I mentioned the investment into the equipment in the post which I understand the initial costs. I’ve been around the hunting and fishing world for many years in our family back home. The time investment is always there sure but if you enjoy it as a hobby you kill two birds with one stone. My father-in-law and parents always processed their own so again thanks for that important part as I’m not aware of processing fees in Ontario. I guess I assumed most people processed their own.. bad on my part. Thanks for your insight Beth… 🙂 If you were to buy a deer in full without hunting how much would it cost someone in Ontario? Now with that said I really went all out this week!! I got amazing deals on meat, veggies and a few other things so I stocked up and hopefully should last us a little while. I bought a student fundraising coupon book and it had a $5 off wub $50 or more and I finally got to use it. $2.97×2 lg international creamer – sweet deal!! Did you notice when you got home that the pop wasn’t on sale? I hate when that happens and we miss it at the cash. It’s not a SCOP just not on sale. Look at the price of zucchini.. wow. How much did you get for that and what do you make? I like how you cut your steak into meals. I find that smart to do. I think if you look at your grocery list from a meal standpoint it might make more sense. I might try that sometime. I don’t know about you but I can see some price hikes or pricey items on your list. That’s likely only a sign of what’s to come . :( You get ballot 22. Well done. Yes I noticed days later when the sale was over. The price of zucchini was $1.29lb and I got eight really nice pieces and I steam all of them for little miss to eat. The benefit of working in the meat dept is I can package everything into divided meals for the freezer before buying. Well , thanks for the encouragement, but I am REALLY good at guilt LOL!!!! I won $100 in January, saved it, and on February 11th., I used the funds to take my granddaughter & her Mum to lunch at Red Lobster, for her 18th birthday, a treat none of us could normally afford. This girl is caring personified. She works hard in school, with a current average of 88%, cares for her 2 sibs with autism whenever needed, sews to earn money towards her upcoming university expenses, is well aware of how tight money is in their home, yet never asks for anything except essentials. I opted to use the $100 to give her a treat, but nagging at me is the guilt over realization that probably, I should have used the won money to pay down my debt. A few things here are budget killers. For example, the Costco green tea (100/bags for $12.79). However, we’ve tried MANY other cheaper brands over the years & nothing comes even close in taste for us. We’ve been drinking our 1 cup/daily when we wake up in the morning since making it part of our healthy eating quest almost 8 yrs. ago when we met & we think it’s worth the health benefits from what we’ve read. Some other budget busters are the 3lb. bag of whole almonds & pecorino romano (sheep cheese) from Sam’s Club. I can explain! lol Since embarking the last number of months on an elimination diet, I’ve been making my own almond meal for a breakfast (apple streusel) that we have once a week & I tolerate it well symptom-wise since it’s gluten-free AND I lose weight with it. It’s not cheap & I could make something cheaper but it tastes so good! It’s my little treat to myself each week since I feel so restricted in terms of what I can eat lately. The fancy sounding sheep cheese? I think I’m lactose intolerant & I’ve discovered that cow dairy REALLY makes my seasonal allergies worse. It seems I can tolerate a small amount of non-cow dairy (sheep or goat cheese) grated & melted on sautéed veggies (yum!) so that’s what that’s about. I’ve already over-spent our $260/monthly budget by $11.37 & I anticipate needing to spend approx. another $40 this week on more groceries to get us through the month. That’s OK though. I know I could become a grocery budget dictator & MAKE the budget work but I’ve discussed it with my husband & that’s not how either of us want to live right now & we have the means to comfortably increase our budget if need be. So you essentially are just documenting your shops to challenge yourself to stay under the $500-$600 range that you previously were spending? Your $260 a month is just a ball-park figure and if you meet it you do, if not oh well? I can safely assume you won’t be carrying over any of the overage to make up the next month. Like you said you don’t want your budget to dictate what you can and can’t do. I’d be broke it I did that lol. I don’t have the discipline like you do plus leaving the window open for the ‘extras’ for us is just asking for it. That being said I’m interested to see if you can beat that past grocery expense of yours. You picked up some amazing deals this week on vegetables, I’m impressed. Apples this time of year are just too pricey to buy in Ontario. I will wait until summer and then we will make homemade applesauce for our boy. Right now buying it in the jars is far cheaper. Just so you know where I kinda randomly picked that $260/month grocery budget target from…I looked at what you & Mrs. CBB spend for the 2 (now 3!) of you monthly & thought “Well, there’s only 2 of us” so I took your monthly budget of $235 + $25/month of the potential stockpile budget you have & came up with the $260. I had no idea what our budget should or COULD be so I thought I might as well take the number you work with & bump it up from there if I need to. Neither my husband nor I have ever used a hard & fast budget in our lives; we’ve just paid our bills on time, lived within our means, & saved some money to boot (even before we met each other). We’re not the type to shop or spend money on “things” besides groceries & eating out, the latter which we’ve had to reign in a few times but not too many. And yes! I like a challenge & enjoy saving money when & where I can so I thought the GGC would be a good fit. And I’m curious to see how little I/we can spend while still eating a fairly restrictive & precise diet which of course seriously limits one’s choice of foods to consume. I kinda suspect that $300/month may be a more realistic grocery budget for us down here in the U.S. However, I expect that to change again when we head back home to Canada where the types of foods we’re eating cost more. We’ll see how it goes from here. Oh ok now I understand. We came up with our figure based on our actual budget and what money we had left after paying the bills etc. I’ve never heard of anyone doing it the way you do it but I’m interested to see how it works out for you. If you want to use the same number as us then plan to stick to that number. If you don’t have a care in the world whether you go over it or not what are you measuring then? I can only assume you do care because you say you live with-in your means. The good thing is you will find out if you need to set aside that $300 instead after the first at least 3 months of posting your shops. That’s what I would do if you don’t plan going the budget route. 🙂 Do you use coupons at all? Mr. CBB, like I said in other posts, I’m finding I do feel a lot better allergy-wise and I’m finally starting to lose some excess weight eating a more restrictive diet. So, I have a few important balls (important to me!) to juggle in terms of coming up with a work-able grocery budget for us that 1) gets me the food that agrees with my body while 2) keeping costs relatively low (but not necessarily fixed), and 3) keeping my husband from divorcing me because I’m driving him nutty with all this budgeting when he doesn’t see it as necessary. 🙂 So, I know I might not fit the profile of some (or maybe many!) of your fans but that’s where I’m/we’re at right now. And I don’t blame you for being confused because I’m trying to figure all this out as I go too! And yes! 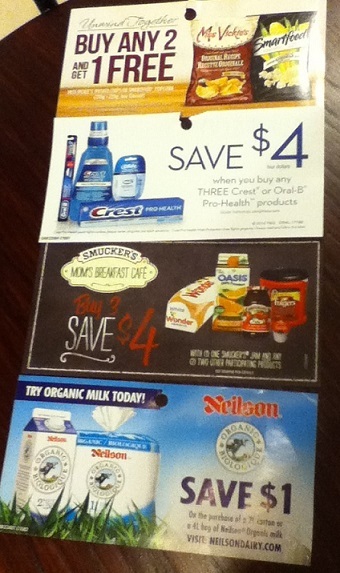 I LOVE to use coupons. I just don’t usually find too many coupons for whole, unprocessed foods like I’m currently eating. 🙁 Now I look for pink stickers instead! Weekly Overview (your final thoughts): Under for the week again!! Two weeks in a row! After the first week I’ve been able to keep things well in line so I have more than enough to get through the month and it is looking like I will be under for the month!! I’m not doing great with coupons, for whatever reason I haven’t been getting the last couple of coupon inserts with the paper.. 🙁 I was looking forward to those Whiskas coupons in Red Plum….oh well.. I am however doing well finding discounts with my meats and such… Those tortellini made a yummy half price dinner with leftover spaghetti sauce from the freezer!! I’ll have to have a look next time I go to London. The Chapters in Stratford is a very small store. The London store in the north end is a big one with all the goodies. It’s the older boy that drinks cider, usually one cup per day with everything else he drinks. That Whiskas coupon was a nice one too…$3.00 off…. If you’re comfortable Christine, you can private message me on Facebook with your address & when I’m back in Canada I can mail you coupons you’d like when I get them in our coupon inserts like Whiskas, etc. I’ve sent & rec’d a lot of envelopes of coupons over the last couple years belonging to different coupon groups & I love giving coupons to someone rather than seeing them go to waste. In fact, if you want to make up a wishlist of coupons, I could then keep a look-out for you & ship you a mess of them when I have a bunch to send or well before they expire. I do this for my husband’s daughter who lives in Alberta & I really enjoy doing this, esp. when the people receiving them are so excited to get them. I also have a local friend that I met through couponing so she usually gives me coupons she isn’t using so that’s another place I have to get coupons from. Are you able to go online & print coupons from smart source.ca, save.ca, etc.? That’s very kind, Leona, wehave to keep passing it on, each one helps one, pretty soon it becomes a movement. I believe we are here to help each other, goodness knows I have received help on several occasions, now I am glad to help whenever I can. Christine, I realized after I posted that you don’t know my last name so I’ll pm you on Facebook & we can exchange info. that way. Sorry for the mix-up on my part. I can hardly wait to get home to Canada & starting cutting coupons for you! If you don’t have a wishlist already to send me, I’d LOVE to have a wishlist from you with grocery, personal care, pet, etc. items (any items you can get coupons for!). Maybe if you don’t have a list like this, you could start to make one & then I’ll know better what specifically to send you. Thanks Mary but I just find it’s a simple thing to do as I come across something that someone could really use or appreciate. I really get a lot of satisfaction out of helping people & I find it’s such an easy thing to do when I’m sitting with my hubby in front of the TV some night or instead of surfing around the internet. It often blows me away but it the thought often occurs to me that coupons are literally FREE money just sitting there for the taking for people who want or need it. Incredible! It’s definitely one way to increase the value of a stamp multiple times over! I agree with you. If we all just did our little part to help someone when we thought about it using the resources, skills, or talents we have, we’d be happier individuals & further ahead as communities. Christine: Yes, we lucked out into some apple cider seasoning mix at Chapters in Kingston on clearance. I didn’t realize at the time that it was instant, not mulled, so it was just an add water kind of thing. However, it’s good flavour, my son ended up loving it. Our store in Brockville is quite small (Coles) and was hoping to find it there for a second one. No luck at our Coles. Overview: 1st week – I’m very surprised that I was under budget this week. I received my Chapmans $4.00 coupon so that actually was free yogurt because I price matched down to $3.99, so YAH me. This month has only started but it will be an interesting month to see how little food in the house will result in groceries that need to be bought. I actually had to buy my 1st ground beef in more than 3 months and boy did I get a price sticker shock. This makes me even more determined to get a large meat order and hopefully even have it for longer. Overview: 2nd Week – I’m trying to make up the overage last month, which resulted a bit of an overage today. I am being more aware of the overage this year and I’m going to try and stay within those boundaries. The next couple of weeks is going interesting at work so my meal plans are going to quick and easy so that I might have it ready when I get home. The best thing about trying to making up the overage is any extra money from the month will be used for debt. I’m going to work really hard at trying to kill that off once for all and never to have it come back. The way our son eats apple sauce I don’t think it will last around her either. Thanks for the great tips! I don’t think that you can ever get something good for free but I believe that it’s possible to save money and buy something good for cheap) We spend a lot of money on food especially when we prefer healthy and tasty products so it’s important to get to know how to cut expenses. For example, I use coupons and always check special offers. One of my best rules is shopping with the list so I try to avoid unnecessary things. If you’re not lazy to save money then you’ll check different things and find different ways to keep your grocery budget healthy. Butcher Shop: Medium ground beef 4.64 x 2, Medium ground beef 4.74 x 2: Total 18.76 but FREE to us as late Christmas gift (this person usually gets something for us in January, just happened to be February this year). Love free food. The late Christmas present this year was wonderful timing. We had been running low on meat in the freezer, so it was a welcome treat. Getting that, we had been saving a gift certificate from the same local butcher and decided this was the week to use it up to build the meat stock again. We had cut back the meat shopping so much, we were running low. The freezer is still well stocked with tomatoes and zucchini from the garden and berries from our local farm (except blueberries). I was contemplating trying to cram all of our stuff into one freezer and unplugging the other. Now we don’t have to do that yet, perhaps by March. However, I have found that even with spending as much as we have been, our fridge is still looking bare. We did get a lot of stuff this week we had been running out of and it wasn’t for the fridge, but it pains me to open the door and see very little in it. Well, at least there should be less waste then. However, that was one of my goals with the new year to waste less food (not that we wasted much to start with) and that is going very well. We aren’t throwing out very much at all. This week it pained me to spend 1.99 on a head of lettuce. We usually hold out for the romaine hearts to go on sale or any lettuce on sale. Not so lucky these days. And, clearance isn’t the same at our RCSS as it used to be. They’ve switched from 50% off stickers to 30% off stickers. That’s been a bit of a hit to the budget and staying on track. Next week, I know we will need a lot of produce, eggs and milk. I’m hoping that there isn’t much more to get, however, I know we are due for laundry detergent and hubby’s vitamins in the next few months. Crossing my fingers for a sale, especially on the vitamins. I will buy them whatever week we get the best deal. I try to stay ahead on those. It isn’t the butcher that gives us the free food, but someone who gifts us meat from that butcher, this is the second year that they have done this. And, the gift certificate I had was from my sister last summer. She often does that when she stays to offset the cost of food when they visit. Lots of diet requirements for her family and it can get pricey. We don’t mind and we plan accordingly, but she feels guilty. I do find some of their prices better than the grocery store and some more expensive. Our butcher runs regular sales. However, with the ground beef, we prefer as much from them as possible since we know what’s in it. Local beef and no filler. It cooks up like a dream. Medium ground beef is like lean or extra lean from the grocery chains. So, it condenses a lot less, if we pay a little more, it evens out in the final volume and we are much further ahead on quality and taste. I have had optimum from the moment it was introduced in Calgary many, many years ago. Calgary was a pilot city for the program and my sister and I had been fortunate to stop in on our way to Edmonton. I have found that over the years, I get less and less out of the program. We just don’t have $50 or $75 to spend at one time to get the high bonus offers to accumulate volume quickly and the weekly offers I get emailed are not great. When we purchased diapers many years ago, they were one of the cheapest places to buy from and we racked up points that way. Often Shoppers was our milk and eggs, but recently I just PM the Shoppers flyer for the eggs if is a full week sale. If it’s a one day sale, we go to Shoppers. Milk, I’ve switched to RCSS since it’s same price and now I get 10% off if I get it Tuesdays. Oh that makes sense then. What a brilliant idea for a gift, meat. 🙂 It can get pricey but if you have coupons you can lower that amount and still get the points. We have over 600,000 points now and that’s what we did here and there. The meat gift is the absolute best. I hope it continues on each year. This is two years in a row we have received it. $20 doesn’t go far with meat, but it’s $20 we don’t spend. Within the next month or so, we will be using up some PC Plus points. We have about 180,000 between our two cards. Not bad since we’ve already redeemed 40,000 points last month. Angela, do you live near a London Drugs? If so, they allow “stacking” of coupons meaning you can use multiple coupons to buy an item as long as each item has a different UPC (bar code). I’ve bought Cold-FX, Arm & Hammer laundry soap and other things like baby formula for a friend, etc. for FREE (I guess I had to pay the tax on taxable items so not quite free sometimes). This is really worth doing for more expensive items like vitamins & Cold-FX. Just thought I’d let you know! Sadly, we do not live near London Drugs. And, there is no store near me that allows stacking, I had heard one store in Ottawa did it at one time, but it’s an hour away and I have no idea if they even do anymore. I’ve always wished we had someplace near that did that. But, at this point, I have found that most of the coupons I find in my area are for products we don’t or can’t buy (serious allergies within our house, especially for cleaning, laundry and beauty products which forces us to buy many organic products leading to higher costs or specific items we just try to stock up on when they go on sale). I cherish the ones that I do find that we can use like peanut butter, cheese, berries, eggs, carrots and Renees dressings. I got 2 x 2L containers of milk free this week when I bought 2 boxes of Cheerios cereal which were already on sale for $2.97(reg $3.99). The coupons were inside the previous boxes of Cheerios. My next door neighbour, who is retired, cleans the Polish social hall after each event, and brings home huge quantities of pasta and salad each time, which he shares with his sons family and me. I freeze it and, in turn, it feeds us and 2 of my grandkids as they seem to be here for supper 3 x weekly now, since I am without wheels to take them home. Oh you were lucky to get that in your cereal box, good for you. YES that’s what I mean about scoring free food from events and work. If you have the opportunity to bring it home or giving it to someone who will eat then do it. Most times if it doesn’t get eaten it lands in the garbage which is such a waste. A grocery budget and a list are really advantageous, Mr. CBB. I used to have none and now I have adopted this kind of mindset. I can see that I have become more responsible over what we put in the fridge and over the table every meal. More importantly, I have monitored how much money we spend in every grocery time. Good for you Jayson, that’s very important. I thought my mixed nut purchased last week was high, until we realised it didn’t have any peanuts in it.Chose not to buy bananas @ $4.99 kg, instead we had oranges given to us, where we are staying, which was unexpected. Some good ideas here to save on the grocery bill!! Hubby used to go fishing and we ate the fish he caught. The perch were nice little fish but I was never happy to see a pike come home…it’s a very boney fish…. Once he cleaned them I would cook them up or freeze if there were too many to eat at once. These are a small fish so I would take a long piece of plastic wrap and roll the fillets up in the wrap. Then I could just unroll a meals worth next time we had some. Years ago we got some venison from my SIL after a deer ran out in front of her husband’s car and he hit it. They shared the deer with the rest of the family. Looks like Sobey’s is switching their points card over to Air miles. I’m thinking about switching my air miles to the cash part of that program as I can’t get the gift cards I used to from Air miles anymore. That was so nice as I would get the GC to use for things like Christmas shopping!! See what happens when they open the new store they are building in Stratford…. The local drug store has a points program that I use as you know and they do sell some groceries there that I can get on sale plus the points to use later on. I have the SDM card but don’t go there much as we don’t get the flyer. The nearest store is also in town, not here. Nice that the Mrs won the gift cards from PC points!!! I have a rewards card from Chapters and had a lovely surprise a number of years ago. They mailed out cards that you could use for a discount, from $5.00- $1000.00. I figured the five bucks was better than nothing as that was what I was likely to win…… I handed the card over while paying for some Christmas gifts and went to hand the girl my debit card to pay for things…. “Oh, You don’t need that, you still have almost $900.00 left on your card…” Both of us looked at each other as we realized at the same time that I had won a $1000.00 card!!!!!! It made Christmas that year!!! We still laugh about it!! I had to use it up by the end of Dec. but I bought a bunch of GC to use for birthday gifts that year for the kids and hubby….and for myself…. I still coupon if it’s something we use and I do use the apps, all but the Save.ca one as I don’t have a smart phone. The last couple of years the money from there has gone to Christmas shopping. Given how tight things are for us it does help that way. I hope to have a few things growing in the back this summer to get us some nice veggies to eat. I don’t have much room but i did find something Karen Lynn posted last week to make your own grow pots from landscape fabric…. I plan to get some of that stuff and make a few to use on the deck. Bringing food home form a meeting or from work sounds good, I remember we brought home the leftover food after my Mom’s funeral. Dad took some and we took the rest. That information from Leona on prescriptions at Superstore sounds like a really good idea if we ever move to a place closer to a Superstore!!! Given how many prescriptions hubby has these days we could do very well doing that!! I am hoping this year to manage to save funds from as many of these ideas as possible to use for Christmas shopping. It would be a big help that way. I know it’s not groceries, or at least not much of it but I save where I can to use later. Another great way we’ve been getting free groceries at Superstore is through their prescription transfer program. It’s been going on for at least the last 2 yrs. that I’m aware of. Get this!–when you have them transfer your Rx from another pharmacy to the Superstore pharmacy, you get a $10 PC Financial gift card every time you refill that Rx- up to 15 times! That means if it’s a recurring Rx that you need to get filled, they will give you up to $150 in PC gift cards ($10 gift card x 15 Rx refills). They will only do it once per person they told me but I collected my $150 in gift cards already. And I had my husband do the same & he’s rec’d his $150 in gift cards. My husband actually had a new Rx from his Dr. for blood pressure pills so I told him to ask at the Superstore pharmacy if they would just treat his new Rx as a transfer for him since he usually used Safeway pharmacy & save him the hassle of giving it to Safeway & THEN asking for the transfer over to Superstore. They said no problem! He likes to have about 3 months of his pills on hand so they filled 3 months–and gave him three $10 gift cards ($30). Definitely worth looking into! We’ve walked away with $300 in FREE groceries just for transferring out Rxs. Incredible! And a nice little side bonus is a $0.50 Superbucks coupon attached to each Rx receipt for you to use on anything in the store. We used to hang onto ours as well but here and there we’ve used them. I think at one point before we moved into our house we had about $400 or so dollars worth. It was great for stocking the new pantry. Hubby and I are hoping to have a little day trip south of the border this coming Saturday, weather permitting. As a result, this week we planned to have a NO SHOP week here in Canada BUT no sooner do you plan to stay out of the stores and there’s some “not to be missed” kind of sale! I am going to post our US purchases in GGC week #4 so that I can upload this week’s Canadian purchases and not hold up everything… waiting to see IF we actually cross the border this weekend or not. This week the good sale was on eggs at SDM @$2.29 per dozen with a limit of 2. Since we postponed the US shopping a few weeks back, hubby ran out of English muffins and bagels for his breakfast materials and instead has been having cold cereal. As a result, we are going through a lot more milk than we usually do over the course of a month. I had him redeem Save On Foods MORE points for a 4L jug of skim milk for a second time this month! I still have lots of fresh carrots-celery-onions for my soups, not to mention frozen and canned vegetables, but I am all out of green onions and radishes. They are on for 69 cents each this week, so we’ll get a bunch of each. Last of the big time spenders huh?? 2 x Lean Gr Pork @ $3.49/lb x 30% off Pink Sticker = $6.26 << HAD TO GRAB THESE! OUR NEXT USA SHOP WILL BE Feb 21st & the details will be shared next week! OUR TOTAL UNUSED RESERVES ARE $1,047.50 … that is a $937.50 carry-forward from 2013 & 2014 and $110.00 in NEW 2015 savings. This also means that with $190.00 to start FEBRUARY less $55.00 transferred to the various savings reserves & an additional $60.00 saved in our US grocery reserve, we opened the month of FEBRUARY with $75 available, less an overage of $9.31 carried forward from January, PLUS we have spent $61.86 on our groceries so far this month and have $3.83 REMAINING AVAILABLE for the month in our CANADIAN budgeted grocery funds. We also have groceries that have been purchased using points redemption(s), rather than the budgeted cash, in the amount of $14.36. If our budget is truly sufficient, when we reach December 31st, those funds should still be available in the form of unused cash. It’ll be interesting to see if they actually are. Note: Another reserve of $233.07 IS AVAILABLE for our next US shop currently scheduled for February 21st! Isn’t that the way it always goes? We say we won’t shop but then those sales grab our attention. How much do you normally pay for eggs? On sale eggs go for $1.99 at SDM or they send coupons we can print so we will use that too. SDM have some decent coupons once in a while in our email inbox. WIll you be stocking up on bread if you go over the border? I don’t blame you doing a no-shop week especially if you are going over. Do you have your US shopping list ready or do you wait to see online flyers first? I only get the $1.99 SDM egg coupon email about every 2 months. In the meantime, $2.29 is a good price because the normal price is $3.99 a dozen. I have my US grocery list ready to go and it’s based on the fact that we won’t have another US shop until May 18th BUT I will be deciding item by item whether or not I can get a better price on the Canadian side of the border now that the exchange is substantially higher. Some items though we can’t even get in Canada and those I will continue to purchase but we’ll see how much we come home with. Yes I would take the $2.29 as well over $3.99. You’re right we get the same coupon every couple of months as well. I like the points on the milk though as it makes it cheaper for us. That’s true I never gave much thought to the exchange rate now so you would have to evaluate what you are buying. No that bakery outlet is wonderful to the both of you. I agree!! Stock up while you can and enjoy those freebies.